Creation- The significance of names is evident at the very beginning of Biblical history. God had just made the heavens and the earth in six days, and finally finished his glorious work of creation by fashioning man from the dust of the earth. After Adam (whose name in Hebrew means “earth” or “ground” from which he was made) was created something very interesting takes place. God brings all of the animals which had been made on the previous days to Adam so that Adam can name them (Gen. 2:19). Whatever Adam named the animal is what the animal was called. Now this all was very meaningful. Not only was Adam’s headship over all of creation demonstrated by the fact that he was fashioned as the pinnacle of creation at the end of the sixth day, but his superiority to the animal kingdom was demonstrated by his power to name them and in so doing define them. By naming the animals Adam’s authority over them was expressed, and Adam imaged God who had first named him. Man was to lead the physical creation in the worship and service of the Holy Trinity. He was to subdue and rule over the world, and the first act of this regal life was the process of naming the animals. Daniel- The list of Biblical accounts of name changes etc. goes on and on. There is a particularly interesting account of the significance of names in the book of the prophet Daniel. You remember the scenario of Daniel’s life. He was part of an elite group of young Israelite men who were captured by King Nebuchadnezzar of Babylon in about 600 B.C.. Daniel and his friends were taken into exile in Babylon from Israel as young men, probably about the age of 16. King Nebuchadnezzar wanted to train these gifted youth in his Babylonian court so that his government would be served by the best. Having arrived in Babylon Daniel and his friends were subjected to a radical re-education process to indoctrinate them into Babylonian wisdom and life and to extirpate any Israelite ways of thinking. The Israelite youths were instructed in the “language and literature” of the Chaldeans. Their diet was altered to conform with that of the Babylonian court, and significantly for our present interests all of their names were changed. “Then the commander of the officials assigned new names to them; and to Daniel he assigned the name Belteshazzar, to Hananiah Shadrach, to Mishael Meshach, and to Azariah Abednego” (Dan 1:7). Here we see a universal recognition of the great significance of names. The name Daniel means “God is judge” in Hebrew, and so it was changed to Belteshazzar which means “May the god Bel protect his life.” Who is Bel anyway? He was a Babylonian god! “By Orthodox practice, an infant is not given a name until he/she is baptized [or in the Naming Service in preparation for baptism on the eighth day or on the day of Churching- ed.]. Actually, in Orthodox countries where the Orthodox faith is the state religion, such as Greece, an infant is not even registered with civil authorities until it is registered by the priest acting as a civil registrar, the priest himself having first named the child. If an infant happened to die before it was baptized, the death certificate would read, ‘an unbaptized boy/girl of (name of parents)'” (A Dictionary of Greek Orthodoxy, Rev. N. A. Patrinacos, Hellenic Heritage Publications, Pleasantville, N.Y., 1984; p.48). Because Orthodox receive their names not at their physical birth but at their more important spiritual birth when one becomes a Christian, and because the names Orthodox receive are saints’ names we call our names “Christian names”. “For You are the resurrection, the life, and the repose of Your servant (N.), who has fallen asleep, O Christ our God…”. At each of these moments the Orthodox Christian is drawn both to a remembrance of his Christian identity and of the nearness of his patron saint whose name he bears. The Christian name given to a newly baptized child or adult is the name of the saint who will be that person’s patron saint throughout his life. “By bearing the name of a saint, the Orthodox acquires an identity akin to that of the saint whose name he/she bears…By Orthodox tradition beginning with the early Church, the Orthodox celebrates his name day on the day of the feast of the saints whose name he/she was given at Baptism. One’s date of birth appears to be of lesser importance to the Greek Orthodox than his name day. The former signifies one’s physical birth while the latter is the all-important day of his spiritual birth. And it is widely believed among the Orthodox that what makes physical birth really meaningful is one’s spiritual rebirth at Baptism” (ibid., pp. 50, 261). “The festival of their patron saint they keep as their Name Day, and to most Orthodox (as to most Roman Catholics…) this is a date far more important than one’s birthday” (Ware, Timothy (Bishop Kallistos), The Orthodox Church, Penguin Books, 1963, p.257). 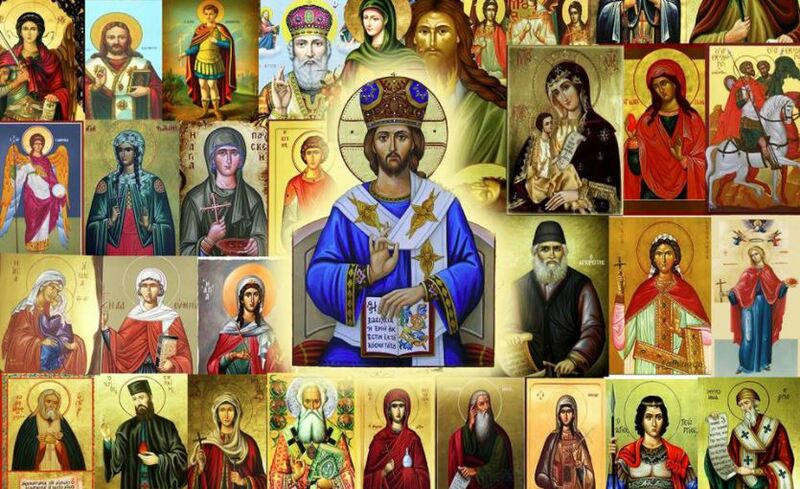 Celebrating one’s name day honors one’s patron saint, and directly connects the Orthodox with his own baptism and the continuing life and intercession of one’s heavenly patron. On this day one should by all means seek to attend the divine service at Church and join in the veneration of his patron, and celebrate his patronage. It is a day of great happiness. In the future faithful Christians may look forward to receiving a final name given directly by Jesus himself perfectly fitted to their character. In closing we leave with a few miscellaneous remarks on the practice of using Christian names. Orthodox don’t name animals with Christian names. To do so is disrespectful to the saints. Did you know that at the time of his tonsure a monastic takes a new Christian name, and gives up using his previous Christian name since monastic tonsuring is viewed as a second baptism and the beginning of a new kind of angelic life? “because he would save his people from their sins” (St. Matt. 1:21). Jesus is the Greek form of the Hebrew “Joshua” which means “the Lord is salvation.” Our Savior was named after that great servant of Moses Joshua who led the people of Israel into the promise land. And so, as the greater Joshua, our Lord shall lead us into that greater promised land of everlasting life and blessedness to the glory of His All-Holy Name! One should learn as much as possible about one’s patron saint, and ask them often for their intercession in prayer.